It seems like the stores stock Christmas decor, Halloween candy, Easter basket stuffers and Valentine's treats earlier every year. The same goes for swimwear, shorts and the ever-popular crop tops of summer. Here in New Jersey, we have only had warm weather for a week or two, but the stores have been stocked for summer since February (which I can't complain about...it definitely made sure I was ready for our March/April trip to Florida). As soon as the new season's fashion hits stores I start brainstorming how to shed my winter weight and how to afford a closet overhaul. Since summer clothes have been out on the racks, I've been on the hunt for the most rewarding (physically and monetarily) programs. Ultimately, I haven't tried anything extreme (cleanses, 21 day challenges, crash diets, etc) or out of reach. Slow and steady wins the race has always been my mantra, especially as a migraine sufferer. I work with the equipment we have at home and that I was born with...I want to save money, not spend it! I've had a Fitbit Flex since I started my desk job 2ish years ago. When I transitioned from a job on my feet to a job in a cube, I definitely noticed a change in my waistline and my Fitbit helps me hold myself accountable for getting up and moving during the day. I love checking my tracker at night and seeing all my goals are green on my dashboard. Since the weather has been nice, I have really enjoyed walking on my lunch break, essentially getting paid to walk (since I have to be at the office anyway). This keeps me from running errands and spending money frivolously on my lunch break ($$) and it also saves me time when I get home. I no longer have to worry about programming the oven so that I can go on a walk when I get home or sacrifice a normal dinner time for my work out. Instead, I can prep dinner as soon as I get home, toss it in the oven until the timer chirps. This leaves me enough time to get on my stationary bike, jump rope, do some HIIT or strength training. On an average 45 minute lunch break, I can get in +/-3 miles (or 6,000 steps). Combined with the running around I do to get ready in the morning and the walking I do throughout the day, I usually have over 8,000 steps by the time I get home, leaving me so close to my 10,000 steps/day goal. This always motivates me to hop on my bike or take the dogs for a walk. Left: My typical FitBit Dashboard after lunch (so close to my goal). Since I really started moving and shaking on lunches, I started looking into apps or programs that reward participants for working out. In walked the Pact App. 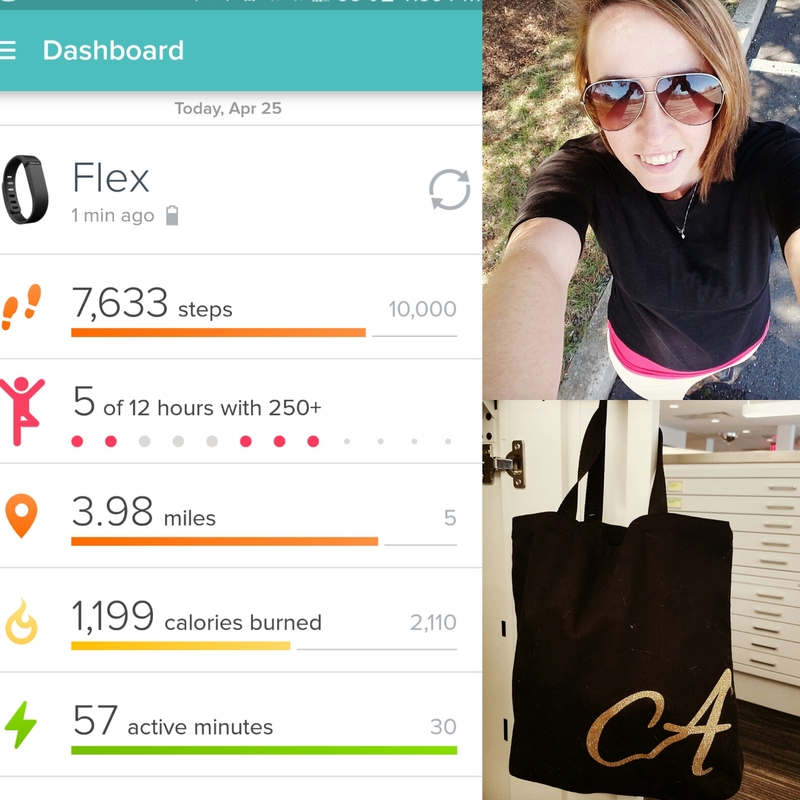 This app pays you for working out, eating healthy and tracking your calorie intake. Pact-ers can earn up to $5.00/week for completing their goals...but, of course, there's a catch. 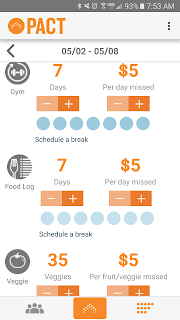 If you miss an activity (1, workout, 1 day food logging, 1 fruit/veggie) the app charges your PayPal/CC a minimum of $5. I love saving money, but I hate paying bills more. This app has really been a great motivator to meet my work out goals and eat my fruits and veggies again every meal. So far, I've only been charged once, based on how the Pact Community voted on one of my activities. But, I've made $14 for doing what I was already doing. For workouts, Pact uses your location and lets you "check in" to a gym for 30 min, uses the motion tracker on your phone to track 30 minutes of movement, or syncs with Fitbit and counts 1 workout if you reach 10,000 steps/day. 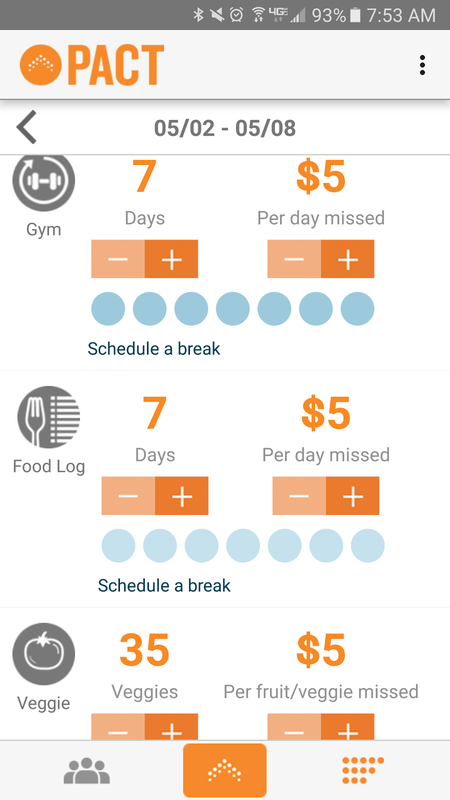 There a ton of other apps that Pact can sync with for non-Fitbit users too. 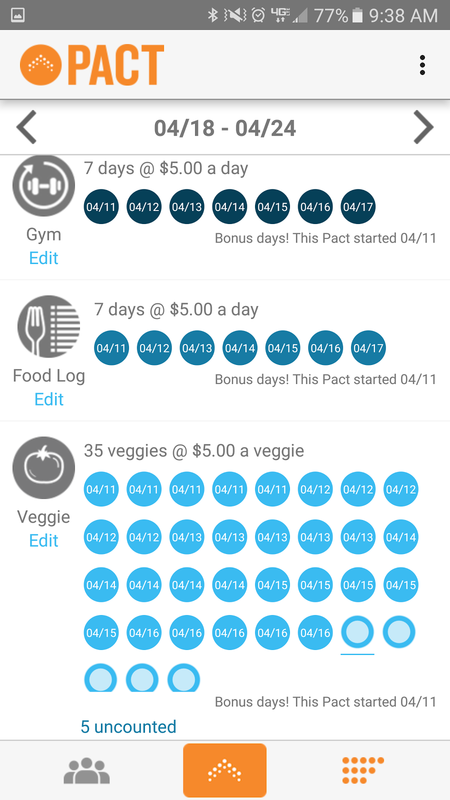 For food logging, the Pact app syncs with MyFitnessPal, and as long as you track 1,200 calories or more, you're good to go. Fruits and veggies are the hardest, since you're at the mercy of other Pact users to vote on your entries. Each serving of fruits and veggies you eat, you submit a photo, for up to 5 a day. The community generally votes you thumbs up if its a full serving that looks like it is being eaten (selfies and bites help show you're eating). In the couple of weeks I've been using it, I've learned a lot about how it works, how to get the best results, so more Pact tips and tricks later. I've got another week of maxed out Pacts in front of me...wish me luck!